Most of us are aware of the "Hurt Report"--that federally-funded motorcycle accident study that we've been referring to for the past 27 years. The official government title is so long and convoluted we just name it after Hugh "Harry" Hurt, the lead researcher. One of the big conclusions of the Hurt Report was that car drivers who crashed into motorcyclists often reported "I didn't see the motorcycle." Ever since then, we've been concerned about how to get noticed in traffic, a subject we usually call "conspicuity." Well, have you heard of the "Olson Report"? It's another federally-funded research project on motorcycle conspicuity that was released way back in 1979. The actual title of the report is "Development and Testing of Techniques for Increasing the Conspicuity of Motorcycles and Motorcycle Drivers". The research was done by P.L. 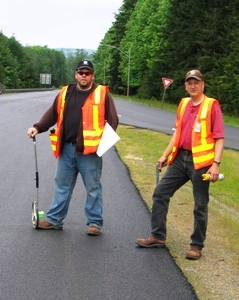 Olson, R. Halstead-Nusslock, and M. Sivak, at the Highway Safety Research Institute, University of Michigan. Let's just call it the "Olson Report." 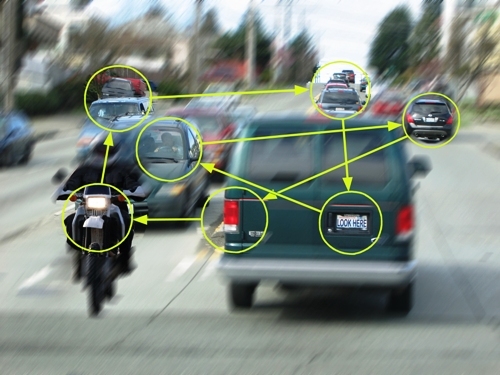 The intrepid researchers wanted to find out what helped drivers see motorcyclists. They developed some theories, then talked some optimistic motorcyclists into challenging real urban traffic on bikes to scientifically "field test" the theories. Amazingly, there was only one crash. I suppose you want the conclusions of the Olson Report up front. OK, wearing a bright colored jacket, especially yellow-green, is very effective. For daytime riding, having the headlight on seems to help. A modulating headlight works even better. For nighttime riding, the combination of running lights and retro-reflective clothing seemed to be important, because running lights are visible in situations when car lights aren't reflecting off your riding gear. For whatever reasons, having a bright colored fairing is not as effective as wearing a bright colored jacket. And some colors are less than helpful. For instance, a bright orange fairing is less conspicuous than a naked bike. Be aware that there are no simple answers to being conspicuous. There are too many variables to provide one simple solution for all motorcyclists in all situations. 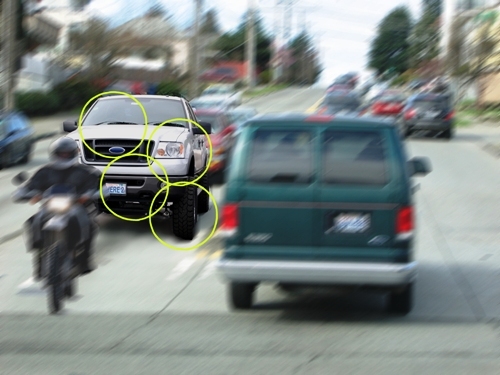 Fortunately the Olson Report includes a comprehensive explanation of how motorists "see" other vehicles, and we can use that information to help refine our own conspicuity tactics. I'll do my best to explain some visual concepts without all the techno-wacky. If you want to read the whole report, you can find it at http://hdl.handle.net/2027.42/487, scroll to 43121.0001.001.pdf. According to Olson, "seeing" is a complex process of monitoring the scene in a relatively fuzzy way with our peripheral vision, and then focusing on whatever details attract our attention. We do this so automatically that we don't realize how complex it is. The center of vision, the "Fovea", is the only part of the eye that sees in sharp detail. The Fovea is only about 1 to 2 degrees outward from the center. The rest of the field of view is called "peripheral." The farther out from the Fovea, the less detail can be observed. If peripheral vision notices anything of interest, then the fovea is triggered to focus on it. As you're reading this, you are focusing your fovea on the details of just one or two words on the page, scanning the line in a sequence of quick glances. What's that got to do with motorcycles? you might wonder. Well, a motorcycle will appear as just a blur in a driver's peripheral vision. In order to "see" (comprehend) a motorcycle in traffic, a driver must focus on the bike to determine what it is. If a blurred motorcycle in a driver's peripheral vision doesn't trigger any interest, then it just remains a blur of no consequence. Most of what you see is a fuzzy blur in your peripheral vision. The only area where you can see details is where you are focusing at the moment�say the license plate of that van ahead. To make judgments about such things as speed and distance, a driver needs to take several successive glances, shared in sequence with all the other stuff being scanned by the peripheral vision. Let's say the driver is attracted to the license plate of the van ahead, then to the driver of an oncoming car, then to a car ahead of the van, back to the van's left brake light, then over to the bike's headlight, and so forth. The sequence of focused glances will be very complex as the driver attempts to take in the various details and remember them. The sequence of focused glances can be very rapid and complex as a driver attempts to take in the various details and remember them. When a driver is looking for other vehicles, there are priorities. Large objects get a higher priority than smaller objects. Let's say a driver waiting to turn left notices an oncoming truck. The truck will probably get visual priority just because it's bigger. So, she glances at the truck several times, and makes some judgments about speed, direction, and distance. If a bike ahead of the truck doesn't attract attention, it just gets ignored. You can understand how a driver might decide to make a quick left turn in front of the truck without "seeing" the bike. Since larger vehicles get a higher attention priority, a driver might focus on an oncoming truck and completely ignore a motorcycle. If there are only one or two vehicles in the scene, the bike might get second priority; in which case the driver might glance at the truck, then glance at the bike, back to the truck, and maybe back to the bike. But if there are lots of other vehicles in the scene, and the bike and rider are not attention-grabbing, the driver is too busy focusing on the higher priority (larger, brighter, more contrasting or fast approaching) vehicles to "see" the motorcycle. Your first tactic to make it more likely a driver will "see" you is to wear a bright-colored riding jacket, preferably yellowish-green. According to the Olson Report, there is more value in wearing a bright colored jacket than having the fairing a bright color. And bright green seemed to attract attention most reliably. More recent studies from other countries have indicated an advantage to wearing a white helmet. Bright light blue and yellow are also colors that attract attention. Due to characteristics of the human eye, red and orange are even less conspicuous than other colors. Black, brown, and dark blue are like camouflage in dim light situations. For riding at night, the report showed considerable benefit in having retro-reflective panels in the riding jacket. Several garment manufacturers have come out with "conspicuity" riding gear. For instance, Aerostich has a "high visibility" garment material that is very bright. Andy Goldfine, head honcho at Aerostich notes: "Hi Viz Lime Yellow 'jumps out' on a primal level because it is not naturally occurring, and because the human eye is most sensitive to light in this part of the spectrum. (The eye is least receptive to red & black)..." The piercing Hi-Viz Lime Yellow carries plenty of visual 'punch' even under incandescent and low-light conditions." " in Motorcycle Consumer News, which has been honored by special awards from the Motorcycle Safety Foundation. Selected columns were edited into two books both published by Bowtie Press. He is also the author of Driving A Sidecar Outfit and a pocket riding skills handbook.